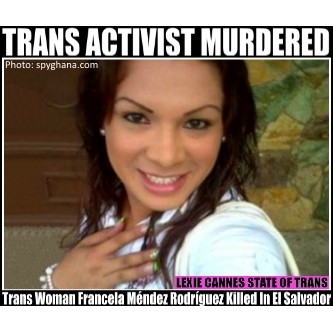 LEXIE CANNES STATE OF TRANS — A number of publications have confirmed the murder of trans woman Francela Méndez Rodríguez in Sonsonate, El Salvador on May 31st. She was murdered while visiting a friend, Consuela Flores Martínez. Through the examination of news reports, I believe her friend, Flores, was not transgender. Although a newspaper in El Salvador described the murder as a hate crime, I was unable to find further details of the crime, nor whether there were suspects. Rodríguez belonged to Colectivo Alejandría, a trans advocacy organization, Salvadoran Human Rights Defenders Network and at least several other human rights groups. Calls from outside the country insist that her death be throughly investigated. Human rights groups and agencies in El Salvador gave conflicting numbers regarding recent trans and/or LGBT murders in the country, however data from Transgender Europe confirms that transgender murders in South and Central America are extraordinary high. “. . . If you check my posts you will see in my country as hate crimes end with the lives of LGBTI people, the most vulnerable population is transgender women. . . .
Cruz also gives an in-depth accounting of Francela Mendez’s accomplishments and advocacy work on behalf of marginalized people in El Salvador in the blog. I see did a photo apparently taken during Méndez’s funeral that showed her coffin partly draped with the transgender flag. Not sure how much of an advocate they really are if they are deliberately misgendering her posthumously. Its fairly common for friends and colleagues of the deceased to do this. With it being a different culture in central and south America, I wouldn’t second guess any of this. The language translation can introduce errors as well. I routinely fix these, but the above was a quote so I left it alone. I was informed that Google sometimes translates “el” into “he” when it should be “the”. As in ” I, You, He, She , Us, They, Them”. ” EL” as ” EL = THE is a determinate article as in “THE” body OR “THE” casket. in the masculine genre. It could have been translated also in the feminine genre as “THE” Woman = “La” Mujer or “THE” transgender = ‘LA” transgender person. So, I am sure Google was right all along.